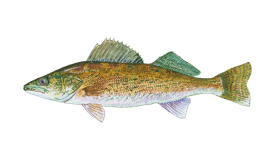 Sauger is the smaller relative of the Walleye, similar in appearance and taste, but more common in fast-flowing rivers than in lakes. At only a fraction of their relative's size, Sauger are most often caught between 0.5 and 2lbs. 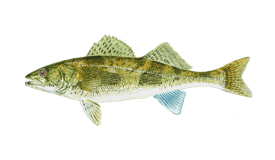 Sauger are native to the southern, western and central USA west of the Appalachians and southern Canada between Alberta and Quebec, including the Great Lakes and James Bay. In rivers, Sauger are known to migrate extensive distances (up to 400 miles) for spawning purposes. They migrate upstream March through May and back downstream April through July. 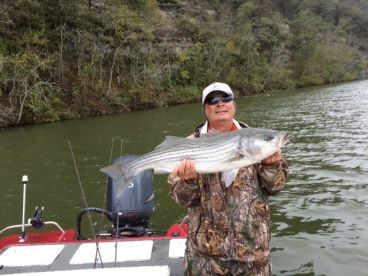 The species is caught on similar bait as Walleye. Depending on the season, either minnows, night crawlers, leeches or frogs should be effective. 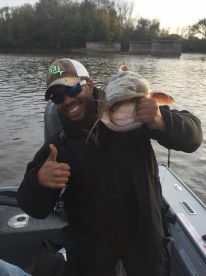 Anglers like tipping heavy jigs with natural bait. 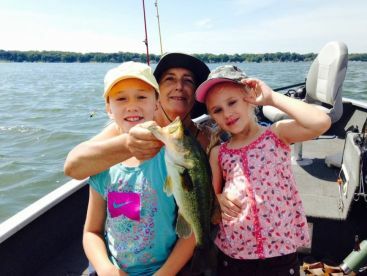 Here is an excellent in-depth article on Sauger fishing, if you'd like to know more. White, delicate and flaky meat.